A hard-running fullback at Illinois, Grabowski became the Big Ten’s all-time rushing leader when he graduated with 2,878 yards. He rushed for 100-plus yards in a single game a dozen times. An Academic All-American in the classroom, Grabowski slashed for 125 yards and a touch-down to pace the Illini’s 1964 Rose Bowl victory over Washington and take the game’s MVP trophy. He collected two Super Bowl rings in a five-year career with the Green Bay Packers. Injuries ended his playing days in 1971. Jim Grabowski’s induction into the National Polish-American Sports Hall of Fame will make him a member of an elite group that has etched an enviable record on the national sports scene. Grabowski’s credentials will only solidify the luminous status of what has become a primrose path to honor and glory for athletes and coaches of Polish descent who carved their way to stardom on America’s sporting landscape. A product of Chicago’s noted Taft High School, Grabowski entered the University of Illinois as a blue-chipper, a recruit that wore a “can’t miss” label and was destined to turn around the football fortunes at the Big Ten Conference school based in Champaign. He didn’t disappoint those who cast him in a pressure-packed role at Illinois. His gridiron heroics carried him from the campus of the Fighting Illini to Lambeau Field in Green Bay and the legendary coach – Vince Lombardi. He performed for the Green and Gold from 1966 through the 1970 season before winding up his professional career in 1971 with the Chicago Bears, a bitter rival of the team he had spent five campaigns with. Grabowski played under Coach Pete Elliott from 1963 through the 1965 season during an era when the Fighting Illini were a monster on Big Ten battlefields. He became the Big Ten’s all-time rushing leader with 2,878 yards by the time he was to receive his diploma at Illinois. He notched 100 yards or more in a single game 12 times in his career. His rushing feats broke records held for years by the immortal Harold “Red” Grange. The bolting fullback twice was named to the All-Big Ten Conference team and twice was crowned with All-American laurels for his slashing rushing and pass receiving achievements in the 1964 and 1965 seasons. Grabo didn’t only demonstrate his skills on football turf. He also starred in the classroom. The proof of his talents in the classroom came when he was chosen on the first team Academic All-America unit in ’64 and ’65. He was third in the balloting for the Heisman Trophy in ’65, a year the distinguished award was won by Southern Cal’s flashy running back Mike Garrett. More honors were bestowed on the gifted fullback in the 1964 Rose Bowl. Illinois clipped the Washington Huskies 17-7 with Grabo knifing for 125 yards and one touchdown. His slashing off-tackle smashes that tore the Washington defense apart was good enough to win him the coveted Most Valuable Player award in the Rose Bowl. Lombardi already had been erecting his fabulous dynasty in Green Bay with a bruising fullback by the name of Jim Taylor. But the wear and tear of pro football was beginning to show on Taylor and Lombardi needed someone to step in and fill his shoes. Enter Grabowski, who was the No. 1 pick in the 1966 draft for the Packers. Grabo was to be joining another superstar – Donny Anderson – in an era when fat paychecks were just beginning to come into existence, thanks to a rival football league operating about the same time. Old No.33 didn’t pack away the individual rushing statistics that he compiled at Illinois, but he wore a Packer uniform long enough to win two Super Bowl rings. He was there when the Packers stopped the Dallas Cowboys 34-27 for a second straight NFL title January 1, 1967. He was there when Bart Starr’s quarterback sneak in 16-below temperature bagged a third straight NFL championship at the expense of the same Cowboys in 1967, 21-17. Green Bay then went on to destroy upstart Kansas City in the first Super Bowl skirmish 35-10. 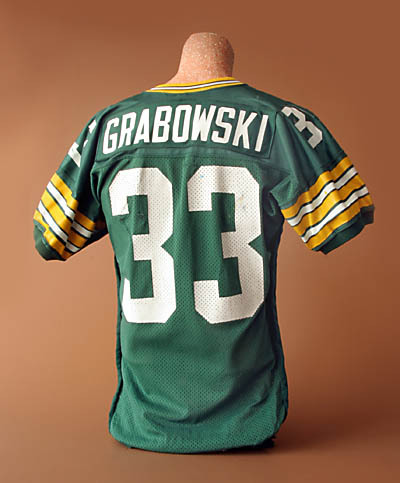 And Grabo was clad in Green and Gold when the Packers routed Al Davis’ Oakland Raiders 33-14 in Super Bowl II, a game which chalked up the first $3 million gate in history. Grabowski twisted and turned for 466 yards in 120 carries, a healthy 3.9 per carry average in the 1967 campaign when the Lombardimen finished the regular season 9-4-1 enroute to their Super Bowl triumph over Oakland. But in another way it was a season Grabo would just as soon forget. He was third in NFL rushing and Green Bay was 6-1-1 in the standings. Then came a game in Baltimore. The Colts’ rugged cornerback Bobby Boyd cut down Grabowski and the play shattered the knee, damaging ligaments and cartilage. The hard-nosed fullback attempted to return to the playing field in two weeks, but only reinjured the knee. He watched the Super Bowl on crutches. After off-season surgery, Grabowski returned to his stylish play and squirted for 518 yards to give the Packers a reliable tandem in the backfield. Anderson led the Packers in rushing in ’68 with 761 yards in 170 totes. Grabo’s knee, however, never did fully recover from the pounding pro football giants could muster on a Sunday afternoon and his rushing production diminished. He finished his career in Green Bay in 1970 with 1,372 yards in 357 carries, a highly respectable 3.8 per carry average in a tough football league. He also had 46 pass receptions for 492 yards. His glittering football career came to an end with the Bears one year later. When someone proudly possesses a Rose Bowl ring, two Super Bowl rings, once held the all-time Big Ten rushing record, twice achieved All-America accolades, and captured the admiration of thousands of fans with his slashing style of running with a football, you’d think he’d pick one of them as his greatest moment in sports. Not Jim Grabowski. The former Illinois and Green Bay Packer star says a hug from his father was his greatest moment in sports. And he remembers it well. The Fighting Illini had just polished off Washington 17-7 in the 1964 Rose Bowl. Grabowski helped destroy the Huskies by ripping off 125 yards and one touchdown. He was selected as the game’s Most Valuable Player, a very coveted award indeed. Then came a visit in the jubilant Illinois lockerroom. Stanley Grabowski went there to see his heroic son. The two embraced. Alert photographers captured the emotional scene. The photo made sports pages across the country. Grabowski never will forget how proud father was of son in the sweat-filled locker room. “I wish he would be able to see me get inducted into this Hall of Fame,” said the honoree. Stanley Grabowski died in 1975.